Teaching vocabulary to students is one of the cornerstones of speech-language therapy. Students who lack vocabulary skills have difficulty with reading comprehension, understanding conversations, and accessing curriculum. Categorization is a key skill in vocabulary development. 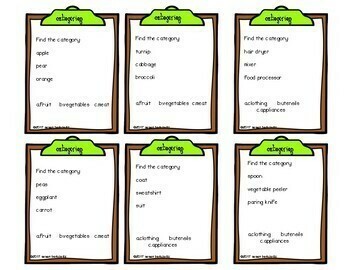 From knowing where to find chips in the grocery store to knowing where to find plankton in the animal world, categorization helps us to organize vocabulary. The ability to categorize runs through the CCSS* from K Language to fourth grade Writing. Here are 84 opportunities to assess and increase students’ skills in this area. • Some cards with multiple choice format responses offer cards with and without picture cues to assist students who need them. • There are 132 cards in all. 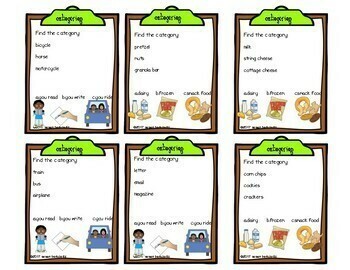 • You can use them as task cards in intervention or classroom settings, or for home practice. Working with mixed groups, with students who have different target skills? 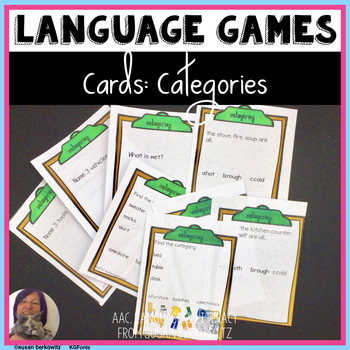 Then try my other game cards for language, and customize the questions for each student.